The progressive jackpots at Slotland.com and its sister site, 3D casino WinADay.com, are at record levels and overdue for a hit. But a player known as LUCKYLADY has announced that she will be the ultimate winner and that all others should quit trying to win either the $179K jackpot at Slotland.com or the $140K jackpot at WinADay.com. The player is so convinced she’s going to hit the jackpot that she advises other players to quit trying. Each time a player increases their bet to play the progressive, part of their wager goes into a huge progressive jackpot pool. With many players playing many different games, all contributing to the same jackpot, the prize can increase very quickly. Slotland’s jackpot is currently going up about $1000 a day. 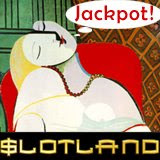 The Slotland jackpot is available on all 16 slot machines at Slotland.com and is currently over $179,000. Slotland’s games, which are not available at any other online casino, include such favourites as the Treasure Box, the Booster and the new Megaspin. The WinADay.com jackpot is separate from the Slotland jackpot and is available only on the six unique games at the 3D casino including the new Slot-O-Matic.